Cutting the cord has grown increasingly popular and many services offer Cloud-based DVRs for cord cutters. However, for cutters who don’t have access to a DVR for the content they watch, Amazon has released the Fire TV Recast, a device with tuners and a DVR for recording over-the-air television. 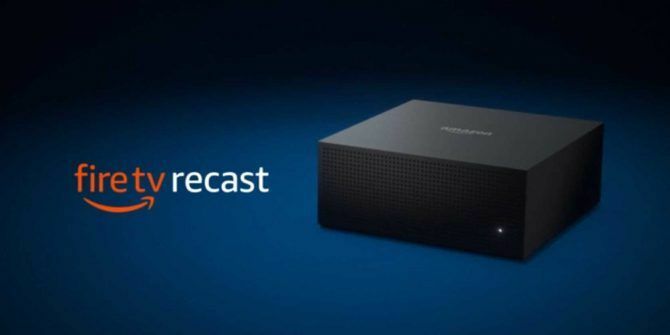 What Is the Fire TV Recast? The device is available in two different models: one has two tuners, 500GB of storage, and sells for $229.99; the other has four tuners, 1TB of storage, and sells for $279.99. The more cheaper one with two tuners can record two shows at once and the one with four can handle four at a time. With an Alexa-enabled device, users can search for shows, change the channel, control playback, and more. As is always the case, you’ll want to check to see which channels are available in your area. If you live outside of the major cities, you might be disappointed in what’s available to you even with a high-end antenna. With the free Fire TV app, users can watch their recorded shows on the go as long as they have an Android or iOS device, which is a feature offered by many popular cable companies and online services like Hulu, YouTube TV, Sling, and others. An important thing to note is that, because everything is recorded locally, there are no monthly fees to use the Fire TV Recast. What Are the Drawbacks of the Fire TV Recast? There are some caveats with the device, though. First, it can only record live TV from an OTA antenna, so users won’t be able to record from a cable or satellite box. Additionally, it will not record content from streaming apps through the Fire TV. Interestingly, the device doesn’t contain the internals of the a Fire TV Stick or Fire TV, as Amazon notes that a Fire TV streaming media player or Echo Show is required. Additionally, the device itself isn’t an antenna, so buyers will need to purchase a separate HD antenna to tune into the shows they want to record. Where Can You Get a Fire TV Recast? As you can almost certainly guess, the device is available from Amazon. As mentioned, the smaller model is available for $229 and the larger is available for $279. The device just released today, November 14, so it’ll arrive in two days if you have an Amazon Prime subscription. If you don’t have Amazon Prime yet, there are quite a few benefits you’re missing out on 10 Awesome Amazon Prime Benefits You May Have Overlooked 10 Awesome Amazon Prime Benefits You May Have Overlooked Free two-day shipping is just the beginning. Here are some notable Amazon Prime subscription benefits you may not know about. Read More if you don’t sign up! Explore more about: Amazon Fire TV, .